It was last month when my wife and I started to incorporate Couples Who Pray by Squire Rushnell and Louise DuArt in our daily routine. While we have used a number of books in our devotional time together in our ten years of being married, this book is actually the first that we have finished together and in such a short period of time. Give or take, a couple of weeks. When we first read the introduction of Couples Who Pray by Squire Rushnell and Louise DuArt, it felt kind of awkward when we learned that the authors were married but have had previous marriages. But as we went along the succeeding chapters, we saw how they remedied their previous mistakes by this essential part of marriage, which they have meaningfully tagged "the most intimate act between a man and a woman." The one chapter a day worked really well for me and my wife. We skipped a day or two, but we generally both find ourselves gleefully anticipating the reading sessions we have every night as we went along. The book has 164 pages with additional appendixes for the necessary questionnaires that the husband and wife need to answer separately. The answers to the questions reflect the perception of the husband and wife of their marriage. It was interesting as we went along discussing how we have answered differently and why. Discussing through that alone allowed for us to see through each other like we would not have done without the activity. The book is also packed with encouraging stories of couples who took the 40 Day Prayer Challenge. A few of which are known celebrities like Denzel and Pauletta Washington, Kathie Lee and Frank Gifford. The authors made it a point that the testimonials of the couples they have interviewed are interesting to read. In a nutshell, Couples Who Pray is kind of a campaign. Calling on husbands and wives to take the 40 Day Prayer Challenge and see how it will change their lives. A lot of couples find it uncomfortable to pray aloud together. Yes, even couples who are prayerful individuals. The idea is bearing your soul as you come in prayer. It is when you allow yourself to be totally vulnerable to God as well as your better half as you pray together that we allow our spouses to see our heart of hearts. As simple as it sounds it totally makes sense. 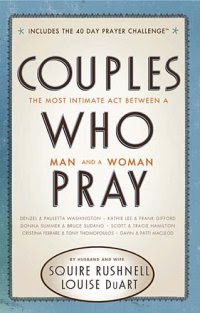 I highly recommend Squire Rushnell and Louise DuArt's "Couples Who Pray". Disclosure: I received Couples Who Pray by By Squire Rushnell and Louise DuArt from Thomas Nelson Publishing for review purposes. I was not required to write a positive review. The opinions I have expressed are my own.